Weld Wide 5 XL Beadlock 15" x 14"
PitStopUSA.com - Weld Wide 5 XL Beadlock 15" x 14"
Weld Racing Wide 5 XL Beadlock 15" x 14" Wheel comes standard with 0.155 6061-T6 alloy rim shells making them lightweight and strong. The forged coined lug holes have three patterns to promote longevity and durability. 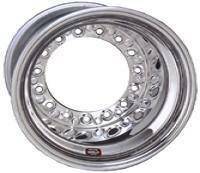 More About Weld Wide 5 XL Beadlock 15" x 14"
Weld Racing 15" x 14" aluminum wide 5 beadlock wheels are perfect for your dirt late model racing program. Weld continues to shave weight without compromising strength. 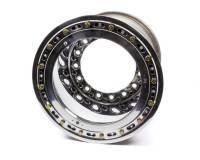 Choose between our Bead-loc version or a roll forged lip wide 5 wheels. Don't forget to pick up your mud covers while you're shopping. 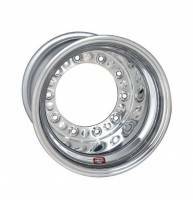 Weld Racing Wide 5 XL Beadlock 15" x 14" Wheel comes standard with 0.155 6061-T6 alloy rim shells making them lightweight and strong. The forged coined lug holes have three patterns to promote longevity and durability. Weld continued shaving weight without comprising strength with its Ultra-Tab mud cover, which eliminates the Bead-loc ring but still retains the Bead-loc system. 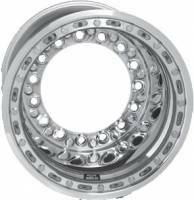 If this wheel is not equipped with Bead-locs, then Weld Racing employs its proven Roll Forged lip for superior bead seat strength. Made in Kansas City, USA.